Wes Johnson of Salt restaurant in the Central West End was in the Today Show kitchen with Al Roker this morning. Click here to view the segment. St. Louis chef Gerard Craft (of Niche and Brasserie) was on The Today Show today (2/27). He did good! Click HERE to view the segment. Amanda Doyle has written Finally, a Locally Produced Guidebook to St. Louis, by and for St. Louisans, Neighborhood by Neighborhood. She will talk about some cool places to eat and drink that you may have never heard of! Here’s a link to more information about her book: stlguidebook.com. Kevin Willmann on Saturday’s Show! Kevin Willmann is chef/owner of Farmhaus restaurant at 3257 Ivanhoe in St. Louis. He is a semi-finalist for the 2012 James Beard Foundation Award for Best Chef: Midwest. We will visit with Kevin on Saturday’s Food Talk STL and hear his thoughts on getting this special nod. Listen Saturday, 11:00 a.m. to noon, on 590-AM, the Fan, KFNS. Or listen online at kfns.com. Suzanne Corbett was on Food Talk STL on Saturday talking about Gumbo. 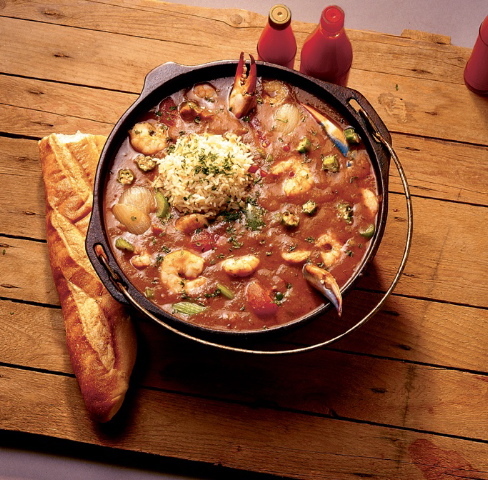 Click on the Recipes tab at the top of this page to see her recipe for Cajun Gumbo, as well as her Lenten recipes for Cioppino (fish stew) and New England Clam Chowder. Click on the Recipes tab above for Suzanne Corbett’s Lenten recipes for Cioppino and New England Clam Chowder. Her Mardi Gras Gumbo recipe is also included. On the Recipes page, we have posted a link to Andrea’s Gluten Free Monkey Bread recipe and to her entire list of recipes that are on the Andrea’s Gluten Free website.